Shadie Lacson, 11, shared a smile Saturday with Lexsis Rulloda-Kim, 11, while performing during the Wahiawa Pineapple Festival at the community's district park. 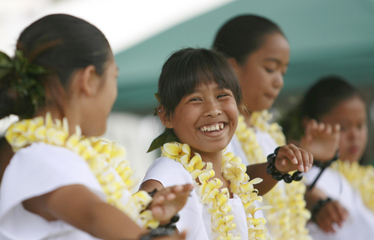 The girls belong to Na Pua O Wahiawa, a halau that is part of an after-school program taught by kumu Leomele Stader at Wahiawa Middle School. 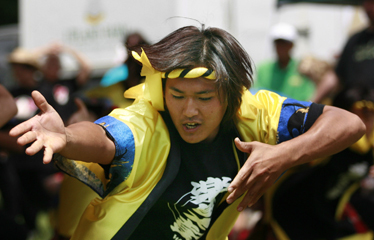 Daigo Yamasaki performed a dance with other members of Lucky Daiko. The festival celebrated Wahiawa's pineapple plantation history with a parade, free entertainment, food from local celebrity chefs, demonstrations, information booths and vendors. 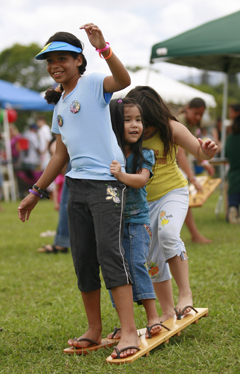 Angelina Inong, 9, and her sister Courtney, 5, powered a three-person geta (Japanese wooden clog) Saturday as Janelle Barbieto, 7, kept up the back.